A Swedish armillary of Atlas mounted onto stone plinth. This vintage Swedish armillary sundial is supported on the single arm of mighty Atlas, and is accented with a copper numeric banding around the sphere's center perimeter. The figural armillary sundial has been mounted onto an antique hand-carved stone plinth foundation. This handsome Atlas armillary sundial on stone plinth, standing at over 3.5 ft tall, will be a striking addition to any garden or landscape. Beautiful wear and patina throughout, perfect for the look. Please refer to the various additional photos for further condition detail. Brass, bronze and copper armillary attributed to Sune Rooth. Warm patina traces of gilt. 28" wide at the arrow and the rings are 16" wide and it is 26.5" high. The vintage mill 'stone' is made from cast concrete. 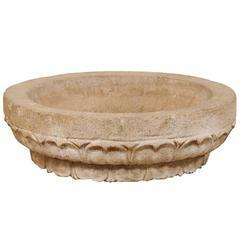 It has the look of stone and will make a great decoration in a garden or home entrance. Diameter for the hole: 1.75". A cast stone sun dial. This sundial has the most ornate detailed ornate cast stone column. The metal sundial with a nice patina.